I was invited to attend this event as media. As always all opinions are honest and my own. Please note that this post contains affiliate links. JustaBXgirl has a few days of school left but I can tell you we are both checked out already. We are ready to travel and enjoy our summer. 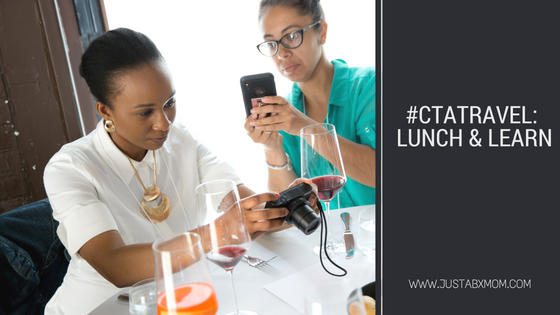 Last week I was able to attend the #CTATravel lunch and learn hosted by Techlicious and got a peek on a few things you’re going to want to pack when you get on your way this summer. The great thing about these items is that it doesn’t matter if you’re traveling near or far they can serve a purpose in making your life easier. And isn’t that what technology is supposed to do? Did you know that U.S. adults spend almost 11 hours a day consuming media? Gasp, shudder, deny and then accept. It is true. And while I wish summer would mean spending more time unplugging let’s be honest here. We will be sharing and perusing through vacation videos and photos on all of our favorite social media sites. We will be bingeing movies and TV shows from planes, trains and automobiles as well as poolside. We will be checking emails on the go just as much as we do from behind the screen and many of us will go beyond the 11 hour mark. It is okay. You are not alone. Roku Streaming Stick – I had heard of the Roku but thought it required a monthly membership. This streaming stick lets you connect to all of your favorite streaming services and more. What does this have to o with travel you ask??? I was wondering the same thing until the brand reps helped me have a complete AHA moment. How many times have you traveled and gotten to a hotel or friend’s home that doesn’t have your favorite channels? I’m going to let you in on the aha moment. With the Roku that never has to happen again. You simply throw it in the bag and take it with you. When you get to your destination you plug it into the computer and stream away. I know, I know. Why did you never think of that? Sony RX100 V – I’m not sure if you have any idea how I go back and forth on if I need an actual camera. I got a DSLT one about a year ago and don’t use it because it’s too bulky to carry around and it is an older model so to use the photos I have to connect to the computer to upload my photos for usage or they get stuck on my memory card forever. This camera is everything my camera isn’t! It is small enough to fit easily in a pocket or purse. You can edit photos on the camera and send them your social media without having to stop at your computer first. It also has a flipscreen that makes it a great vlogging camera. I will definitely accept this for my birthday if anyone is wondering!!! MyCharge Pride Limited Edition – I fell in love with this portable charger the moment I set eyes on it. First of all it doesn’t require an additional wire. I always hate having to carry arround my iPhone wire and a USB wire to charge my portables. This one plugs directly into the outlet so all I have to worry about is not forgetting my iPhone cord. Second, the message on the charger is LOVE. How can you not remember to spread love in this world when it is looking you in the face? Oh and 5% of sales go toward The Trevor Project so you can know your purchase is helping people.